Have a butchers at the new Chadwicks website! Excuse the pun, but the new Chadwicks Family Butchers website really is off the meat rack! 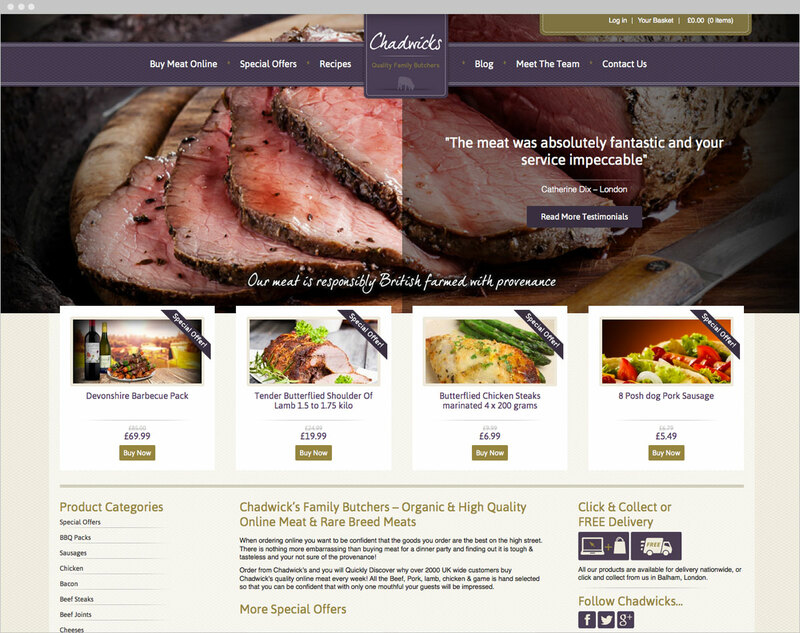 Gary Chadwick of Chadwicks Quality Family Butchers approached us to re-design, and re-launch their website along with a brand refresh and an added ‘online shop’ to allow customers, existing and new, to purchase quality local meat online. Our main focus when beginning the design was the logo and colour palette. Using a deep purple with a textured pattern gave us the ‘quality’ look we wanted and coupled with a gold accent colour and a layered design, really creates a lot of interest on the website. As a member of the Q Guild of Butchers, Gary Chadwick and his family are highly regarded, passionate about their produce and love finding excellent products from dedicated farmers – either organic or rare breed. The new website has been built in WordPress so it allows Gary and his family to update and add information whenever they want and keep people informed about any recent news, events or special offers they have running at any time. Chadwicks are also keen to utilise social media, so we have updated their Twitter account and Facebook page with the new brand as well as adding a Blog, so all their activities can be shared online. The feedback from Gary was fantastic and he is really pleased with how the new website works and is looking forward to getting stuck into all the tools WordPress has to offer, when keeping the website up to date and fresh.